Beretta's A400 Lite Synthetic is a hunting shotgun that does it all and that doesn't mind playing hard and getting dirty. The Blink gas-operating system is capable of delivering 4 shots in less than one second, while the action is self-cleaning, so it requires much less maintenance. Its stock sports a super-soft, no-snag Micro Core recoil pad, while the "S Grip" checkering pattern gives you a positive hold, and the shim system gives an adjustable LOP. The barrel features an Optima HP choke system, highly-visible fiber optic sight, and a ventilated rib which helps keep your eyes on the target. 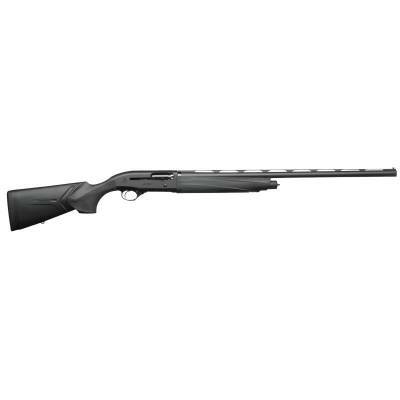 This 20 gauge model has a 26" barrel with an extension. Its stock features Beretta's Kick-Off system. The pistol grip has a built-in GunPod2 unit, a Bluetooth-compliant electronic unit that transmits all the information you want about your hunt to a smartphone app. GunPod 2 is a smart digital system powering a new way to enjoy hunting. GunPod 2 will turn your iPhone or Android device into the first digital hunting diary. Gather and organize the highlights of your hunting sessions, along with photos and videos while you're hunting, and collect your hunting trip memories in a handy digital archive. Stop wondering how many cartridges you shot last month or how many miles you walked with your dog: GunPod 2 will hold these statistics for you! You can keep track of details like the gun model and caliber, the type of ammunition and the weather conditions. Ready for bragging rights? With GunPod2, you can share the details of your hunt with your friends or on your favorite social network.